ZEI 2257 provides you with professional compliancy tools to proactively manage and satisfy today's complex record-keeping provisions. In the event of an inspection you can be confident that the requested records will be easily located and presented in the appropriate manner to facilitate a trouble free inspection. This insightful tool scans performer and content records to help you identify and correct potential compliancy issues. Mitigate risks by receiving advanced notice of what records may need further attention prior to actually being inspected. An external, read-only inspection tool is provided to easily search, retrieve and print/export records of interest for Federal Inspectors. Records are presented in accordance with 18 U.S.C. Section 2257 regulations to ensure a smooth inspection process. Retrieve records by utilizing powerful search capabilities, or use built-in indexing mechanisms to find relevant information quickly and accurately. At a glance, view the performer's recent identification, assumed names, appearances, and other pertinent information. Easily examine content details that include producer, custodial and performer records related to the creation of the production. 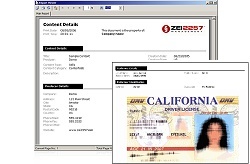 Compliancy reports are easily printed or exported to popular file formats such as Adobe PDF, Microsoft Word and Excel.